Looking for an authentic private way to San Francisco experience? Trade the tour bus for a vintage Volkswagen van that easily navigates the city’s less-traveled lanes. Vantigo’s San Francisco City Tour takes you through 14 famed districts, complete with views of Alcatraz, the Golden Gate Bridge, Twin Peaks and several other storied landmarks. Along the way, we’ll share tales of earthquakes that shaped the landscape, industrial shifts from the 1849 Gold Rush to the rise of Silicon Valley, 1960s counterculture, and surprising insights that only a local would know. Whether this is your first San Francisco visit or you’ve lived here for years, you’ll see the city from a new perspective. Book today. Then, sit back and enjoy the ride! 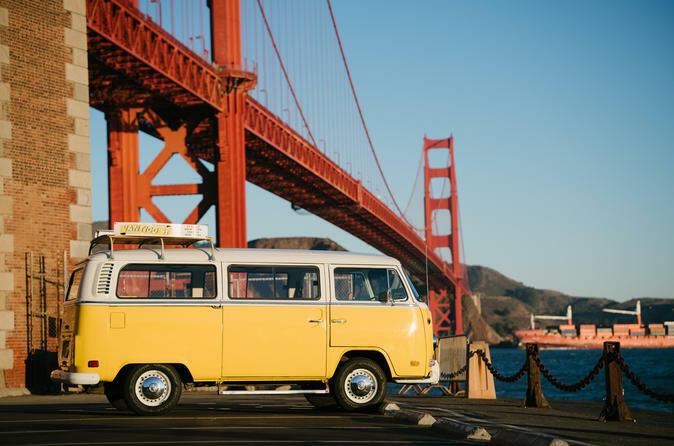 Our Private tour takes place in one our fully restored VW van showing you the highlights of San Francisco in 4 hours. The tours starts at 9 am and 2 pm giving you chance to really soak in the city. The tour route includes Union Square, China Town, Financial District, North Beach, Coit Tower (Photo Stop) Fishermen's Wharf, Palace of Fine Arts (Photo Stop), Golden Gate Bridge/Fort Point (Photo Stop), Seacliff, Legion of Honor, Sutro Baths(Photo Stop), Ocean Beach, Golden Gate Park, Haight Ashbury, Twin Peaks (Photo Stop), Castro, Painted Ladies (Photo Stop), and Civic Center.